Back in April I visited Frances Short Pond here in Flagstaff— a pond fished by man (sometimes woman) and osprey alike. Blackbirds and grackles occupy trees and the marshy island in the middle of the small pond. 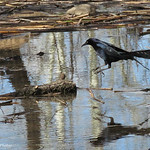 Here is a great-tailed grackle (I think), caught mid-hop.